Brief Description: Aqueon QuietFlow™ Power Filters feature four stages of filtration–mechanical, chemical, biological and wet/dry–for the cleanest, clearest, healthiest water. 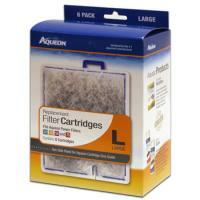 Notify me when "Aqueon Power Filter 55/75" is re-stocked. 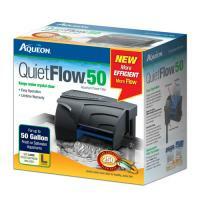 Aqueon QuietFlow Power Filters and cartridges were designed with the fish and the aquarist in mind. Our patented designs include unique features to enhance water quality and clarity, increase oxygen levels and lessen noise. 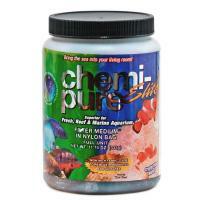 Higher flow rates ensure higher dissolved oxygen content for healthier, more active fish. The internal pump design helps dampen noise, eliminates leaks and starts up automatically after cleaning or power interruptions. Stage 1 - Dense floss removes particles and debris. Stage 2 - Activated carbon removes toxins, odors and discoloration. Stage 3 - Patented Bio-Holster removes toxic ammonia and nitrites. 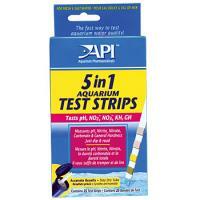 Stage 4 - Diffuser grid removes additional toxins while adding oxygen for more active fish. It also reduces splashing makes the return exceptionally quiet.